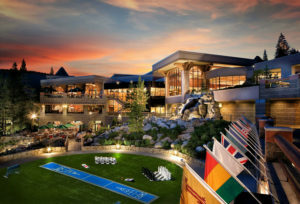 The Resort at Squaw Creek is offering some fall events that should be appealing for visitors to this Lake Tahoe destination hotel. Resort at Squaw Creek rests at the base of Squaw Valley ski resort and features an idyllic mountain setting. The resort has a variety of new offerings for fall, including a seasonal Halloween Harvest Festival, Fishing Derby and Resort Restaurant Month, celebrating the area’s natural beauty in the quieter months of the year. With an array of festivities, activities and delectable food, fall is an ideal time to enjoy a stay at Resort at Squaw Creek. Whether guests are seeking a relaxing family vacation or looking for an adventurous fall getaway, Resort at Squaw Creek provides quality service and amenities to ensure an appealing stay. Resort at Squaw Creek’s signature Halloween Harvest Festival will celebrate the delights of the season across two weekends of fun family activities. Just steps from their room, guests can enjoy face painting, S’mores and Stories, a Fishing Derby, caramel apples and more. Guests are welcome to take a stroll through the resort’s pumpkin patch, chose their own to carve and enter their design into a contest for a chance to win a free night at the resort. Beginning Sept. 12, Resort at Squaw Creek will host its first ever Restaurant Month, featuring new seasonal menus at Six Peaks Grille, Montagna and Sandy’s Pub. Six Peaks Grille will feature a four-course prix fix menu with wine pairing highlighting locally grown seasonal flavors on Wednesdays and Thursdays for $85 throughout the month. Every Tuesday at the newly renovated Montagna, guests can order one entrée and get the second half price. Sandy’s Pub will also be hosting Pub Trivia on select Wednesdays during the month, with a chance to win $75 food and beverage tab. Alongside Trivia night, the resort will host a raffle with a variety of prizes, all proceeds donated to those effected by the California Fires. With an array of festivities, activities and delectable food, fall is the ideal time to enjoy a stay at Resort at Squaw Creek in a tranquil and scenic setting. For more information or to make a reservation, visit www.destinationhotels.com/squawcreek or call at 800 327-3353.